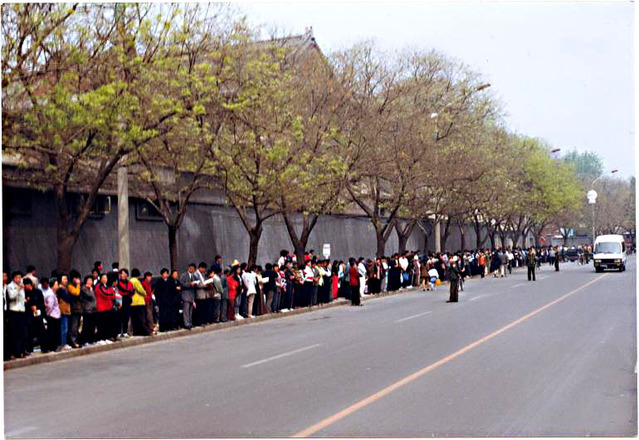 The peaceful demonstration of over 10,000 Falun Gong practitioners in Beijing on April 25, 1999, was the beginning of 15 years of non-violent resistance to the brutal persecution of a group of people who follow the principles of Truthfulness-Compassion-Forbearance. The event marked a turning point for participants and witnesses alike, and also made a long-lasting impact on the rest of the world. Contrary to conventional understanding, the full-blown persecution of Falun Gong was not triggered by the April 25 peaceful demonstration. Rather, the persecution was the inevitable result of the nature of the Chinese Communist Party (CCP) at odds with Falun Gong's principles of Truthfulness-Compassion-Forbearance. Mr. Zhong Weiguang, a Chinese scholar and author living in Germany, began researching Falun Gong after the April 25 demonstration. He first saw news of the event in newspapers in Germany. Zhong was very impressed by the fact that over 10,000 of his fellow Chinese citizens overcame the generally pervasive fear of the regime and went to the Zhongnanhai central government compound to call for the restoration of their right to freedom of belief and practice. He found this all the more notable, given the relatively recent horror of the 1989 Tiananmen Massacre. Mr. Shi Caidong was a PhD candidate at the China Science Academy in 1999. He was one of three Falun Gong representatives brought inside the Zhongnanhai compound when then Chinese Premier Zhu Rongji invited them to sit down with him and discuss the reasons for the gathering. Mr. Shi now lives in New York. When asked why Falun Gong has attracted so many highly educated people, Mr. Shi said he thinks that besides people's innate kindness and longing for Truthfulness-Compassion-Forbearance, the deeper reason is that Falun Gong reveals universal truths: "I was born with the innate desire for seeking the truth. I wanted to know how and why, but there were so many puzzles that I could not find answers to. Falun Gong resolved all of my questions about life and the universe. After learning the truth, my heart became serene, calm, and joyful. Ms. Wu Yanxia, a former senior lecturer at Tianjin City Landscape School, didn't participate in the April 25 demonstration. However, the event prompted her to take a new look at her path of cultivation. “I had cultivated for over two years by then. However, I had been a CCP member for 26 years and was severely brainwashed. Even though I knew that it was wrong that Falun Gong was mistreated, the CCP's teaching of 'align with the Party line' had such a restraint on me. Who dared to resist all those 'struggles' the CCP ran during its rule? We were all afraid of being implicated. I was so impressed that so many people dared to step forward and make a stance. “Even though I didn't go to Beijing on April 25, 1999, the event inspired me and enabled me to break away from the CCP's spiritual shackles. I was subsequently able to safeguard Truthfulness-Compassion-Forbearance with dignity,” Ms. Wu added. On April 25, 1999, Lucy Zhou was in Ottawa, Canada. She and her husband, upon hearing the news of the peaceful appeal, immediately wrote a letter to the Chinese Embassy in Canada. They have been dedicated to clarifying the facts about Falun Gong and the persecution ever since. Many may think that Truthfulness-Compassion-Forbearance is only a slogan. Who can really sustain those principles in the face of the very real threat of imprisonment, forced labour, or even death? Yet, Falun Gong practitioners' 15-year-long peaceful resistant shows that it can be, and is, done.